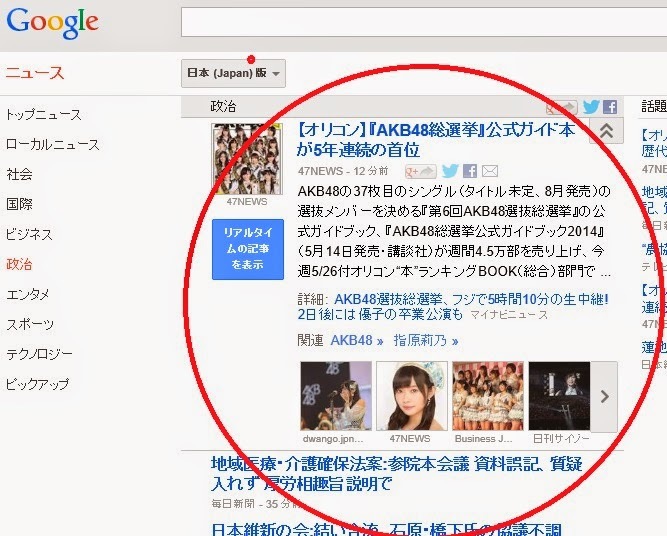 It's that time of year again, when the fan election for the "president" (sosai) of girls megagroup AKB48 (Link) and its affiliates confuses the algorithms of Google News, causing the AKB story to be displayed in the #1 position in the Japanese-language Google News / Politics feed. Given that the next electoral test of the nation's actual political parties are the unified local elections of next spring -- which, contrary to their name, are not unified, the terms of local offices having been spread all over the calendar by deaths and resignations (WIGFTL*) -- and that the next Diet elections do not have to be held until 2016, the election of the 2014 leader of AKB48 leader election perhaps should be the top story on the politics page. After all AKB48's sosai is the only national leader chosen in a direct vote by the people -- and the only national election of any kind save the reaffirmation votes on the justices of the Supreme Court, which happen only together with the first House of Representatives election after the appointment of the justice in question, then every 10 years thereafter (Article 79, Constitution of Japan). The story encircled above? The news that for the fifth year in a row the thick electoral guide to the AKB48 leadership election is the highests-selling book (All Categories) in mid-May. * "Which Is Good For The LDP"
http://pic.twitter.com/Mzz0uLju0c this screencap (taken last year if I recall) of a potentially biased poll seems to do the rounds a bit on Twitter and such. There's some thoughts that this can correlate towards a image of a younger generation that are, or are becoming more apathetic towards politics - particularly post-Koizumi where the constant swapping out of Prime Ministers and confidence was pretty low before Abe 2.0 came along. Or perhaps the bias in this poll demonstrates the consumption power, brand loyalty etc of a particular demography.